You’ve got to love a church that has a Poet in Residence, (currently Marilyn Nelson) and lists Judy Collins as one of their artists/musicians in residence. Never mind that it is a beautiful space, with a lovely communion service, and an socially active community……now there is also a stunning art installation by Xu Bing on display for all to enjoy. Unlike Anne Patterson’s installation for Grace Cathedral, (see previous posting), this artwork is not site specific, and wasn’t originally intended as a cathedral installation. Xu Bing, a contemporary Chinese artist, had been commissioned to create artwork for the World Trade Centre under construction in Beijing in 2008. He decided that the glass atrium between the building’s two towers would be the perfect setting for two phoenixes, the male Feng and the female Huang. The phoenix is an important symbol of unity and peace in Chinese mythology. 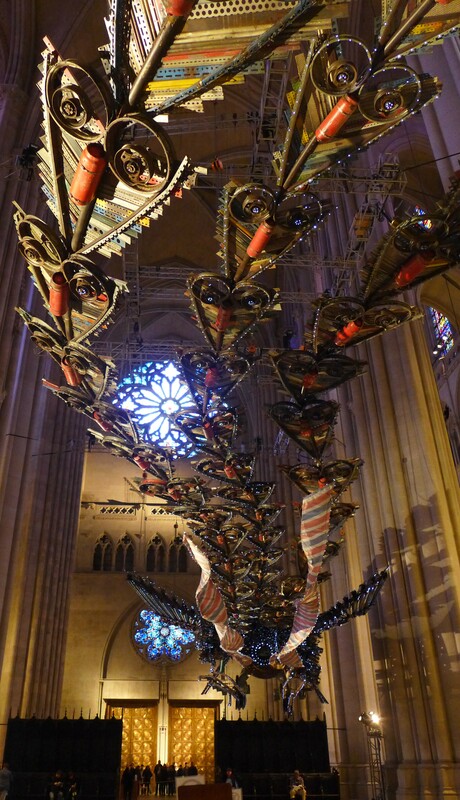 Xu Bing chose to construct the birds from the detritus of the construction site. How apt for a phoenix? Construction was delayed, in large part due to the demands of the Beijing Olympic Games, and then the financial challenges of the times. The builders became more cautious, and censorious. They demanded that he cover the structures–all 12 tons–in crystals, as they appeared ‘unfinished.’ When Xu Bing refused, all money and support for the project was withdrawn. 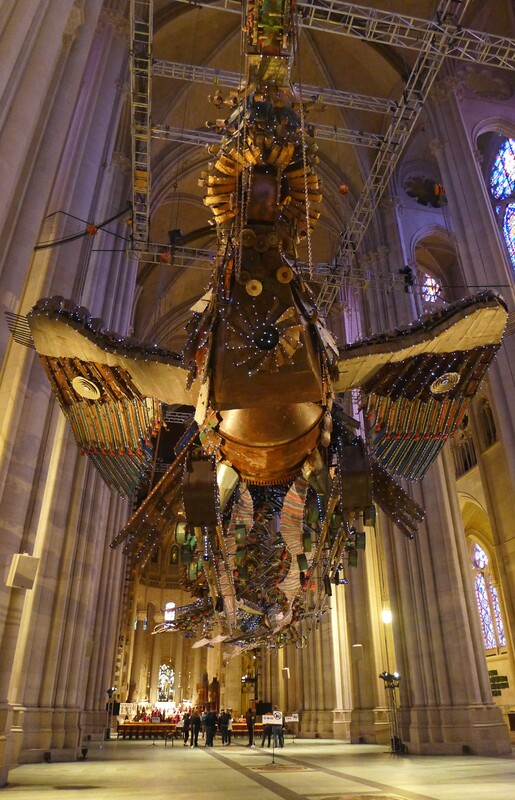 This entry was posted in Art Installation, Cathedral of St. John the Divine, Installation art, New York City, Xu Bing and tagged art installation, Cathedral of St. John the Divine, installation art, Marilyn Nelson, New York City, Xu Bing on November 25, 2014 by terryvatrt. I think I gasped when we entered San Francisco’s Grace Cathedral for a Sunday morning service. I was expecting to enjoy ‘regular’ cathedral grandeur; I didn’t know about the art installation. There are nearly 20 miles (miles!) of ribbon suspended in the cathedral. The artist, Anne Patterson, worked with the congregation to create this art work. Some of the ribbons have prayers written on them. Movement and heat from the congregation cause the ribbons to sway and shimmer. I love how the idea of the spirit (in Latin, spiritus, the breath) is evident in this work. The colours of the ribbons reflect the colours in the stained glass. Those windows are worth a trip (and a couple of hours) alone! And I haven’t even mentioned the sculptures. The church does have docents available, who are more than happy to talk about the art work in the cathedral. Anne Patterson was the church’s Artist in Residence for 2013. Because the installation is so popular with the congregation and visitors to the church, its showing has been extended to the end of 2014. So now you HAVE to go to San Francisco. There are worse things on your ‘To Do’ list, right?! 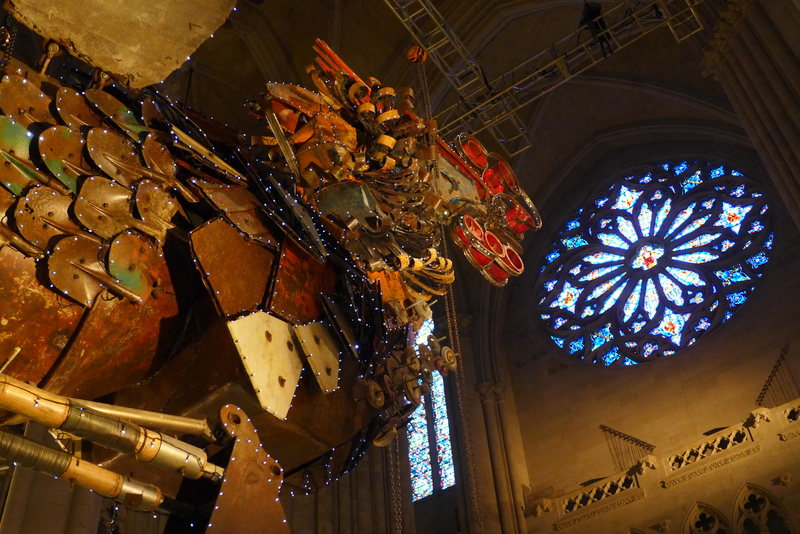 This entry was posted in Anne Patterson, Artist in Residence, Grace Cathedral, Sacred art, San Francisco and tagged Anne Patterson, art installation, Grace Cathedral, installation art, Sacred art, San Francisco on November 5, 2014 by terryvatrt.